I can’t wait for you to see the new fabric line “The Dress” by Laura Heine with Free Spirit. It is the soft fabrics that bring her collages to life! 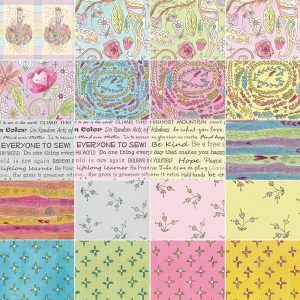 Check out her new patterns that have these softer colors. 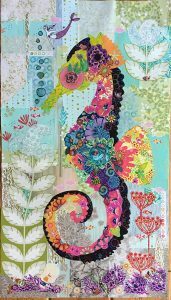 The giraffe and seahorse patterns are mini versions of her popular patterns. 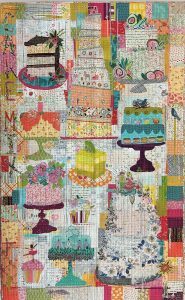 Cake Mix Collage is a total collage – including the background. 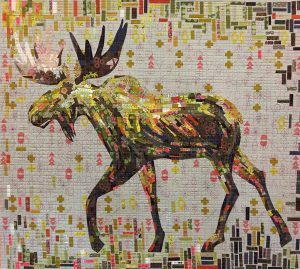 Montgomery Moose Painterly appears to have brush strokes but it is a piecing technique that Laura has created. The patterns are arriving next month the fabric in December – just in time for Winter classes. 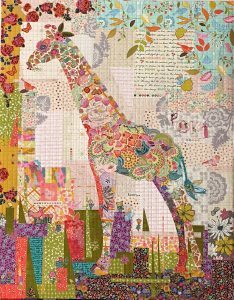 This entry was posted in Fabric lines, Patterns, What's New and tagged Free Spirit, Laura Heine by Penny Haren. Bookmark the permalink.